Isabella and Ferdinand Spanish Language Adventures™ is an innovative Spanish language learning program for children in the Washington DC area that seeks to give students both linguistic and cultural fluency – providing them with advantages in our growing bilingual society. Founded by two accomplished Latina mothers who were looking for high-quality Spanish classes for their own young children, Isabella and Ferdinand Spanish Language Adventures™ has grown into a dedicated team of language teaching professionals who have created a dynamic and effective curriculum - immersing children in high-caliber Spanish, while learning about the art, literature, music and culture of Spain and Latin America. 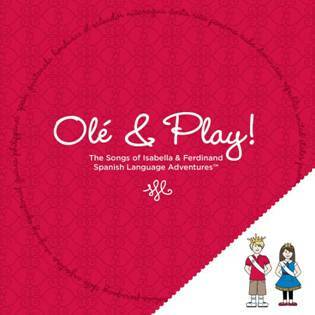 In order to share this wonderful teaching tool with parents and educators nationwide who are looking to further the bilingual interest and ability of their children, the thirteen-track “Olé and Play!” album will be released digitally on Tuesday, April 19th in advance celebration of Cervantes Day (April 23rd – the birthday of Miguel de Cervantes). Akin to the impact of Shakespeare on English, or Dante on Italian, the famed Spanish novelist/poet/playwright’s influence is so strong that Spanish is often referred to as la lengua de Cervantes (“the language of Cervantes”). My Take on the CDThis CD was an amazing multi-cultural experience! My wife taught elementary spanish for many years so I am always a huge advocate for immersion of children early in learning of a foreign language. I loved the idea of this foreign language center and the CD itself. In listening to this CD, I have to say that it is a fun, light, toe-tapping adventure. 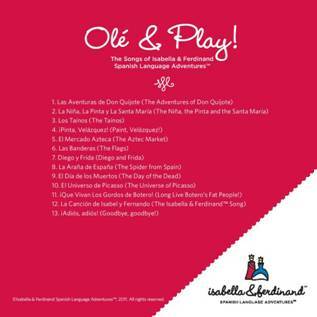 Even if you do not speak spanish (yet) this CD will come to a better appreciation for the language and the music! I loved the fact that (as you might notice in the video above) in the making of this CD, they utilized kids from the language school as well as professional artists. This partnership allows the listener to again hear the amazing power of being multi-lingual! FREE Homemade Mother's Day Cards from TinyPrints! Book Review - There I fixed it! Spring Has Sprung With Four New OLIVIA Episodes! Mandisa releases new album "What if We Were Real"
EXPORTING RAYMOND - In Theaters April 29th! Rocko's Modern Life: Season One on DVD 6/21! Disney African Cats - Coming to Theatres Soon!